You can see some of the mammoth finds on display at the Museum of Culture & the Environment on the CWU campus in Ellensburg. The current exhibit is in a display window called “Window on Central,” facing the public hallway. It features two of the actual mammoth bones (a 4 foot-long leg bone and a neck bone), one of the two human-made artifacts, and overview of research at the site. On weekends when the museum is open, there is also a “mammoth cart” with cast reproductions of mammoth bones found at the site, and digging tools. These can be touched and picked up by visitors of all ages. A 4-foot bone looks pretty impressive in a picture with a youngster! 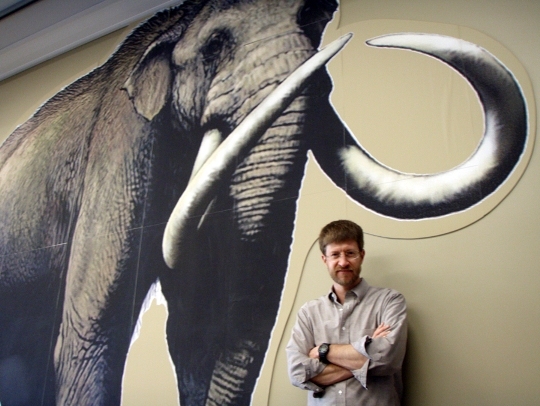 From 2010-2012, there was also a lobby wall exhibit with a full-size mammoth illustration and some explanation about mammoths and bones found at the site. By 2012, the mammoth illustration was showing significant wear-and-tear, and so it was removed in the summer to make way for a new exhibit. A smaller version of the mammoth illustration will be added to the “Window on Central” exhibit. The Museum is located on the ground floor of Dean Hall, on D Street between 11th and 14th Avenue. It is free and open to the public. The mammoth display is open whenever the building is open, generally 7 AM to 5 PM Monday through Friday, and also when the museum is open.